The premise that a dirtbike manufacturer could, in the span of just a few years, build streetbikes that overcome the might of industrial giants like Honda and BMW et al. is a little far-fetched. And yet, KTM has done exactly that, offering motorcycles that rival or exceed the offerings of its better-established competitors. 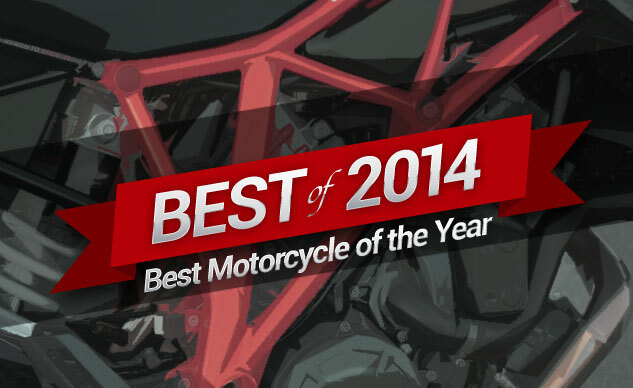 Witness KTM’s fantastic 1190 Adventure, a winner in our Best On-Off-Road/Adventure category. But it’s the 1290 Super Duke R that wowed us most, boasting a stupefying balance of performance and usability. Simply put, its vast breadth of talents on every possible paved surface is unprecedented. The SDR pleases its rider from the first turns of its wheels, with superb tractability, even at low speeds, that helps it ace urban testing. Don’t let that manageability fool you, though. When pointed down an open road, the Super Duke unleashes its devilish side. Fully twisting the 1301cc V-Twin’s throttle is an eye-opening, arm-stretching experience, accelerating with a ferocity of horsepower and torque beyond any other naked sporty bike ever produced. The SDR’s well of performance is so deep that it shines even when subjected to the rigors of racetrack duty. With surprising grace, the Duke overhauled many full-on sportbikes during our track testing, and its speedo regularly flashed past a lofty 160 mph at Auto Club Speedway. With its uncommonly accommodating riding position, it’s the perfect antidote for tall riders afflicted with the curse of not being able to comfortably fit a typical sportbike. It astonishes for its sheer speed, combined with its almost regal over-the-road comfort, making it an ideal choice if ever faced with riding to a trackday in the next state over. The Super Duke is compliant and amenable no matter what non-dirt moto task is set before it. And, really, it seems like reasonably decent dirt roads wouldn’t present too much of a problem, either, given its wide handlebar and in-control ergonomics. The naked sportbike segment is one of our favorites here at MO, and its current list of contenders has never been deeper or more thrilling. 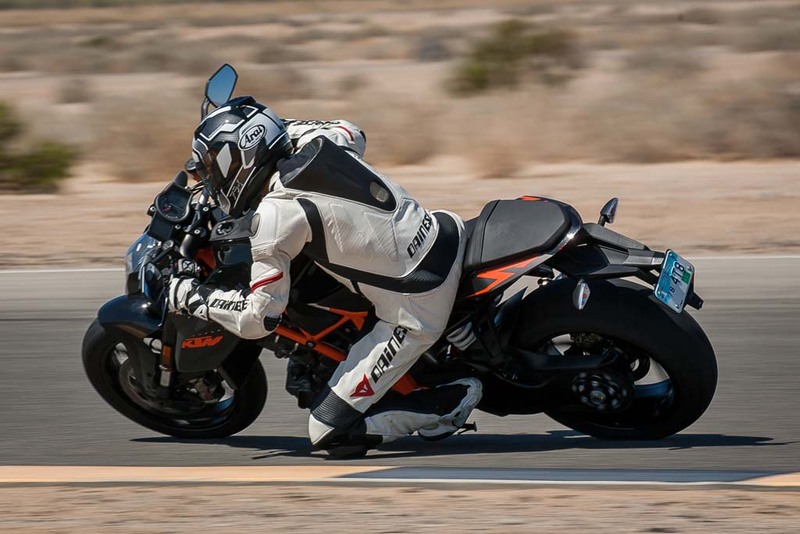 Despite the presence of highly desirable new or revamped contenders in the class, it was the KTM that overwhelmed five stout rivals over the course of our three rounds of testing. The Super Duke R isn’t just our Motorcycle of the Year, it’s one of the best motorcycles we’ve ever ridden. 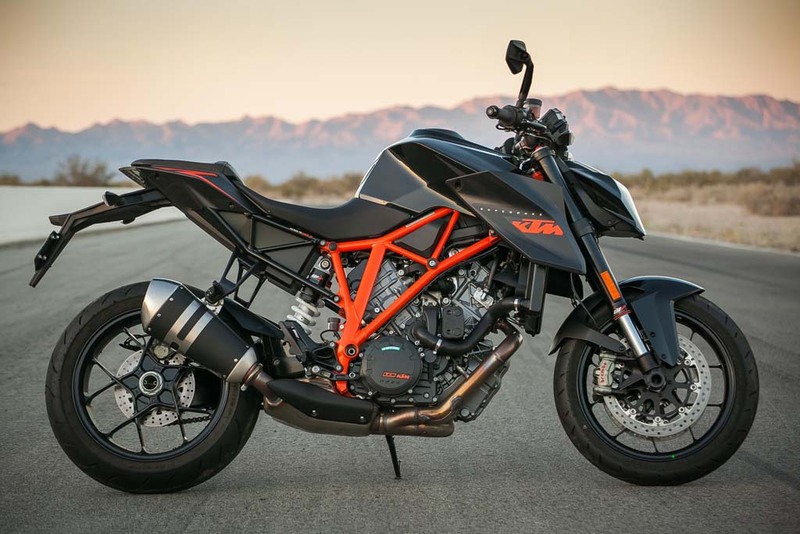 KTM could’ve called it the Superb Duke and still be understating its capabilities. Balance defines this motorcycle – balance enough to cooperatively coax a newbie into motorcycling while also being able to satisfy even skilled riders. 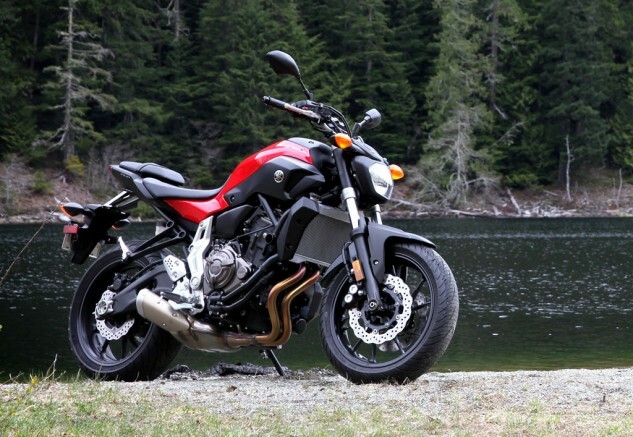 There are some other bikes that have similar commendable balance, but there are none that do it at a price as ridiculously low as the FZ’s $6,990 MSRP. A frame and swingarm built from steel rather than costlier and lighter aluminum reveal the FZ’s price-point mission, but the bike doesn’t really suffer for it. Its 397-lb curb weight is 45 or more pounds lighter than its class rivals, and its chassis performance is remarkably athletic whether dodging urban traffic or unwinding your favorite twisty road. Of all multi-cylinder engine configurations, parallel-Twins are likely the least revered by gearheads, but the stellar one in the FZ-07 might convert the naysayers. It uses a 270-degree crankshaft (rather than a typical 360-degree format) to give the inline-Twin a cadence similar to a 90-degree V-Twin, yielding a pleasingly rich sound and feel. It’s not easy to make a cheap motorcycle look expensive, but Yamaha has done an admirable job of giving the FZ style far above what its price might indicate. The just-right stance and attractive finish detailing give the impression the FZ costs thousands more than it actually does. And let’s not underestimate the importance of street cred. Many junior-level riders are tempted by the obvious coolness of supersport bikes, but those riders would be much better served by a sporty roadster like the FZ-07. It’s extremely easy to manage at any speed, and its neutral riding position comfortably fits riders of almost any size. 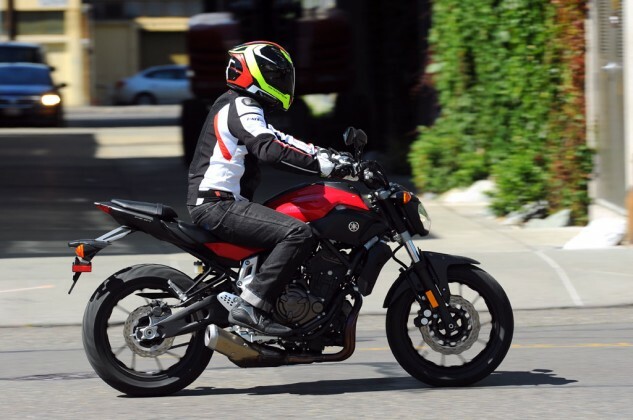 Perhaps the best compliment we can give the FZ-07 is that we believe it’s a better value and a more complete package than Yamaha’s exhilarating three-cylinder FZ-09, itself a worthy contender for awards this year if not for its glitchy throttle-response issues. Taken as a whole, the FZ-07 proves to be much more than just the sum of its parts. Its handsome appearance and sublime balance lets it punch way above its MSRP weight. In terms of smiles per dollar, Yamaha’s FZ-07 is unbeatable.